Let’s go big on solar power! Solar power is on the rise across America, meeting our energy needs in a way that’s clean, local and independent. And it starts with communities like yours. Investing in local solar power installations can help communities and their residents keep more of their energy dollars at home and create good local jobs. 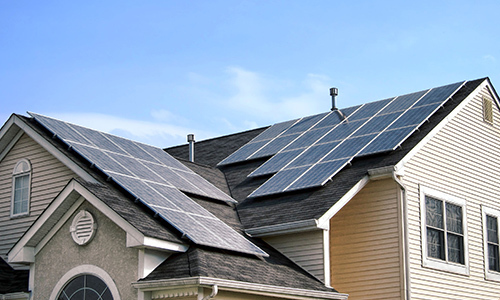 Many homeowners can take advantage of state, local or utility programs to help go solar. Solar tax credits. Some states offer tax breaks for solar power, such as property tax credits, or tax exemption for the installation of panels. Bulk purchasing programs. Bulk purchasing and public education programs can help residents of neighborhoods “go solar” together. 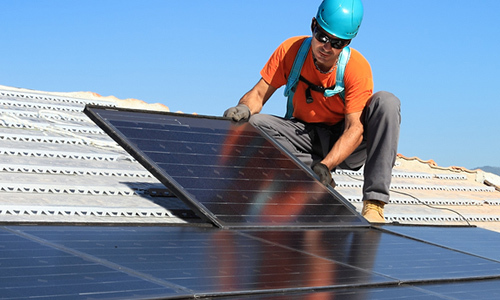 “Solarize” programs connect solar installers to many customers at a time and reduce cost for installers and consumers. Property Assessed Clean Energy (PACE) financing programs allow property owners to borrow money from a specially created fund, repaying the loan over time through their property taxes. If you don’t own your own home or don’t have a sunny roof, there here are a number of ways you can tap into solar energy. Share solar with your community. Community solar programs allow customers who share a roof or who cannot access solar because of shade or roof orientation to support solar power and reap the benefits. To see opportunities in your state, you can visit Shared Renewables, or the Community Power Network. Low-income customers can find great resources here. Businesses: Businesses can reap great benefits from solar and set examples for the rest of the community to follow suit. The U.S. Department of Energy can help businesses navigate the process. Schools. As large consumers of energy, solar can help schools save money, reduce carbon emissions and create educational opportunities for student and the community. You can view resource guides from the Community Power Network and the National Solar School Consortium. Set a goal and commit to it. Ambitious goals for solar power provide a rallying point for the public and elected officials. Lead by example. 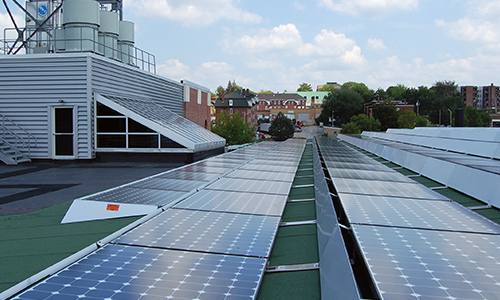 Government can boost the local solar market and reap the benefits for taxpayers by installing solar power on the rooftops of public buildings. Get local utilities involved. Cities and towns should encourage the electric utilities serving their areas—whether municipal or investor-owned—to partner with them in unlocking the potential of solar energy. Reduce unnecessary red tape and fees. Going solar should be easy and hassle-free. Permitting, installation and interconnection fees make up a significant part of the cost of a solar project, and cities and towns can remove or reduce these fees to make solar power more accessible to residents and businesses. Right now, we only get 2 percent of our energy from solar, versus 39 percent from coal, which fuels global warming. Getting 10 percent of our energy from solar by 2030 would be the equivalent of taking 59 million cars off of the road. If we take the right steps today, we can harness more power from the sun and leave dirty energy behind.